With a stay at Onyado Nono Namba Natural Hot Spring in Osaka (Namba), you'll be within a 10-minute drive of Shinsaibashi Shopping Arcade and Tsutenkaku Tower. Featured amenities include complimentary wired Internet access, dry cleaning/laundry services, and multilingual staff. When you stay at Hotel Route-Inn Kanda Ekimae in Kanda, you'll be steps from Ryukyu Islands. Featured amenities include a 24-hour front desk and laundry facilities. When you stay at Ufufu in Izu, you'll be within a 10-minute drive of Myotoku-ji Temple and Kodo-ji Temple. 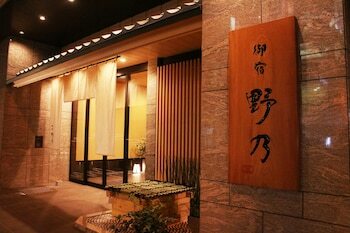 With a stay at Iwayu Ryokan in Misasa, you'll be just steps from Hawai Onsen and Okutsu Onsen. Free self parking is available onsite. When you stay at Kasuitei in Yonago, you'll be 10 minutes by car from Yumigahama Park. Featured amenities include luggage storage and an elevator (lift). Free self parking is available onsite. With a stay at Lakeside Villa Suimeikaku in Chitose, you'll be just steps from Lake Shikotsu and Lake Shikotsu. The front desk is staffed during limited hours. Free self parking is available onsite.